Moving freight around the country is obviously quite important to our economy and making that task easier has been a key reason behind the governments Roads of National Significance programme. Yesterday the Ministry of Transport released an update to its National Freight Demand Study. Here’s the introduction to it. The movement of freight plays a vital role in a modern economy. The freight task in New Zealand is substantial, moving the equivalent of about 50 tonnes per year for each member of the population. Given the size of the freight task and its importance throughout the economy especially in supporting the movement of exports where the costs and quality of freight transport services may be particularly critical, effective planning is important to ensure that the freight sector is able deliver effective support for the wide range of activities in the agricultural industrial and commercial sectors. This planning needs to be supported by an understanding of the sector and of the different activities which it encompasses. The National Freight Demands Study undertaken in 2008 (2008 NFDS) was possibly the first attempt to provide a comprehensive understanding of the sector and to provide forecasts of future activity at both a nationwide and regional level which could be used as the basis for this planning. However with the passage of time the results have become outdated, especially given the advent of the global economic crisis which emerged just as the study was being completed. This study therefore updates the earlier work and also takes the opportunity to expand the analysis, taking account of additional experience in this area and including additional sources of data particularly those derived from the Freight Information Gathering System (FIGS) developed by the Ministry of Transport. These were not available for the earlier work. Freight movements have been measured two ways, by weight (tonnes) and by distance (tonne-kms). As expected roads are still carrying the bulk of our freight with 91% of the tonnes and 70% of the tonne-kms. 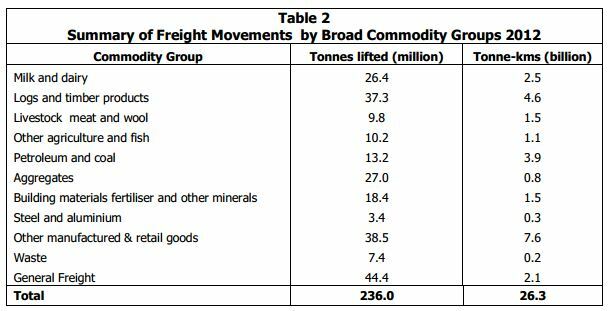 Comparing the changes in freight volumes, perhaps the most interesting aspect is that overall while the total tonnes have increased slightly (up 5%) the tonne-kms actually fallen slightly (down 2%). There were only slight changes in mode share with only rail seeing an increase across both measures. Diving a little deeper the report breaks freight volumes down by the type of freight being moved which shows some key differences between different types of freight. For example while General freight is the largest commodity group by weight, it doesn’t have nearly the same impact on a tonne-km basis as many trips are likely to be local ones. 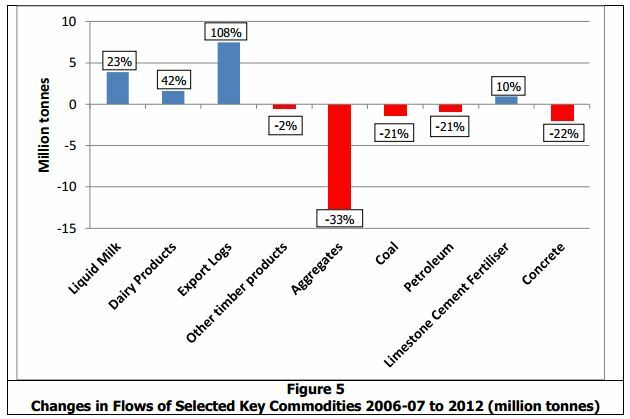 The changes in some of the selected commodities since 06/07 is shown below and in itself if fascinating as it shows some big increases in the dairy and forestry sectors but a big decline in aggregates in particular. If anything with all of the road building going on I would have thought aggregates would have been up. 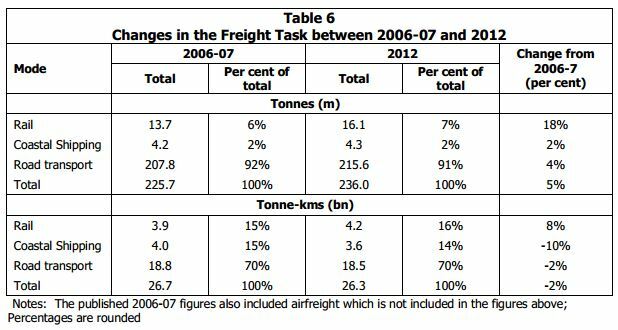 The report even manages to break the regions where freight is going to and from. This is just the Tonnes measure but a quick calculation shows that the region that has the highest percentage of freight leave for somewhere else in NZ is Taranaki with 40% destined for elsewhere while the region with the least freight leaving it is Northland with only 10% (4.9 million tonnes) leaving the region. That’s quite a key point as one of the things we’ve long suggested is that if the government was really about helping Northland, it wouldn’t be building the Puhoi to Wellsford RoNS but would instead spend a decent chunk of that money on actually improving transport in Northland itself. Going forward freight volumes are predicted to keep rising with the biggest increases by origin being in Auckland which is largely due to its population growth and associated increases in economic activity. Auckland is also expected to continue to grow as a national distribution centre. Modeshare changes have also been predicted and despite the recent increase in the use of rail to move freight around, the prediction is for trucks to handle a a larger share. It will mean a lot more trucks on the roads (~48% more) and freight trains on the tracks (~44%) to get goods around. We’ve suggested before that something we should look at in more detail is rolling out truck only lanes to some key routes which is something that would be possible with better alternatives for commuters like the CFN. It also means the third main from Westfield south to Papakura is going to be essential but perhaps we will eventually need a fourth too. On the issue of the third main I’ve heard that the total cost to complete it is only $39 million and the only reason it isn’t being built is that Kiwirail are trying to force Auckland Transport to pay for it using the argument that if they don’t that there will be increased impact on passenger services. There are also big increases predicted in Canterbury, Waikato and Bay of Plenty. Of course the latter two form part of the “Golden Triangle” through which large amounts of freight already flow. Didn’t the previous version of this study come up with hysterical projections like “freight volumes will double by 2020”? Now we find a pretty tiny increase in the past few years and WAY lower projections going forward. What are the assumptions that lead to the predictions of massive increases? A reversal of recent trends towards efficiency because of what? Also massive multi-billion investment in RoNS for truck freight yet rail freight is growing and road freight not….? Also aren’t 30 year predictions just too distant to be of any use; far too much is uncertain that far out. They are predicting lower annual growth in freight (about 1.54%) that you would expect GDP to grow (2+%) so are obviously factoring in some efficiencies. (Unless my maths is way out, which is highly possible). Matt I’d suggest the key market for aggregates is the building industry (all that concrete, basecourse etc…) which is just pulling out of a protracted slump. This would explain the ‘other timber’ and ‘concrete’ contractions for the period. 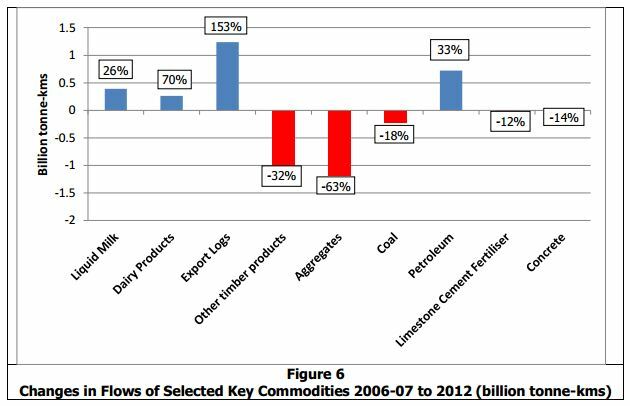 There seems to be a lot of emphasis on primary produce of the type NZ exports. Where do imports (and distribution of imported goods to consumers) fit in? Is it mostly “other manufactured and retail goods”? And does the origin region then show the port where these goods arrived in the country? So it turns out that by far the biggest section of road transport (by tonne-km) is… logs. Low-value, unimproved and basic logs. A many-billion dollar subsidy to an industry that is increasingly doing less and less value-added work. Gold-plated motorways to get logs to Auckland, Tauranga, and Wellington, where they are shipped around the world and then turned into products of actual value. The other interesting thing is that all of these decreases come after the government increased maximum truck weights by 50%. Gerry Brownlee’s press release trumpeted the study as vindication for the Roads of National Significance programme, but the detail didn’t really bare that out. Most Northland freight stays in Northland – probably because exports overseas go to port at Whangarei rather than heading to Auckland. The Holiday Highway does practically nothing for Northland. 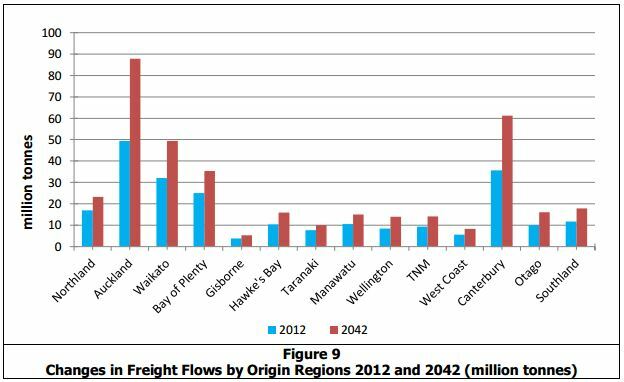 Manawatu freight flows appear to be split evenly between Wellington and Taranaki. Probably means we have a 10 lane Brownlee-bahn from Palmerston North to New Plymouth to look forward to. If KR want AT to pay for the 3rd mainline, then why not. If AT build it then AT can require all KR freights to use it (at least from 7am to 7pm) and charge KR for the privilege of using it. Sounds like a Win/Win to me. Yes it won’t pay for itself tomorrow, but will eventually. And isn’t that AT’s role – make these long term “free of politics” investments for the good of Auckland? And now that Orakei Point plan change is operative (http://t.co/NgmbAEXZft), KR better sort out their act out with at least making sure there is room for the 3rd Main line in that location quick smart or they’ll miss the boat entirely once the railway corridor (“trench”) is capped and the development at Orakei point proceeds. Very interesting figures and comment thereon. The RoNS concept may have seemed forward thinking in the period it was conceived (no doubt with considerable input from the freight industry) when the present Government was in opposition, but time has moved on. It is becoming increasingly apparent that the RoNS programme is not going to give the taxpayer/motorist the best value for money. It is definitely time for a rethink and mindset change at the national level. I just can’t see why the Government are so pig-headed when the appropriate indicators are becoming so clear. They are not above a change of direction with regard to other matters when it suits. Because their policies are not based on evidence or BCRs or economic analysis. They are based purely on a neoliberal philosophy and the agenda dictated by that will be stuck to come hell or high water. It doesnt matter what the consequences are for society or the country’s finances. It is really like debating with any fundamentalist. There is no logic or science, it is just adherence to a set of beliefs. Yes Warren and managed well it needn’t involve a backdown, just an announcement that the (ahem) ‘successful’ RoNS programme is being extended to include all modes to further increase its value to the whole economy: Infrastructure of National Significance or IoNS. I am expecting a further CRL commitment from the gov during the election campaign and this would be a good way for them to pitch it, and of course to further steal thunder from opposition parties in AKL… There you go; free advice for any party. Does anyone else see the funny side of the intro? “We paid for an expensive study to tell us what’s going to happen in the future. Then the future happened THE VERY SAME YEAR and it wasn’t the future the study predicted. A lot of people don’t seem to understand that railway lines have a capacity, just like roads, canals and even footpaths. During surveys I have noticed that when a freight train goes through passenger services are disrupted and traffic at level crossings is brought to a stand still to accomodate a long slow moving train. Maybe rather than having to build a line for freight trains the freight services could just be timetabled during the interpeak and off peak periods. Instead we seem to have a system where passenger trains fit around the freight services despite the fact that the value of passenger time is far higher than the freight. Maybe overnight services might be too much given the Council wants people to live nearer the rail corridor but why not ban freight during the peak times and run freight trains during the day only. Because freight trains especially the MP (Metro Port Services), 211, and 210 (the premier freight services) have priority over the passenger services in Auckland. That said their “slots” are meant to be outside the peak periods although I know of at least two MP services that rattle through Papakura around 7:30 in the morning. Reason? Freight makes Kiwi Rail money – not passenger services. That said when those freight services fall out of their slots it becomes disruptive. I guess that is why the areas near the railway line have all that development potential. No one actually wants to live there. Aggregates may be down because road maintenance has reduced as a result of roading money being channeled into fewer, but more expensive, projects. Most roading aggregate is for maintenance not new roads.